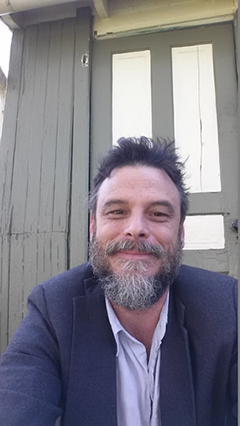 The Indiana University East School of Humanities and Social Sciences (HSS) will present the Regional Writers Series featuring Appalachian woodworker and poet Steven Scafidi on Wednesday, April 3. The HSS Regional Writers Series brings both established and emerging writers of significance to campus for workshops and public readings. Scafidi will give two talks while he is at IU East. The first talk is at 2 p.m. on woodworking in the Tom Thomas Gallery, located in Whitewater Hall. This talk is in coordination with the Wood Sculptors Invitational Exhibit featuring the work of Tom Bartel, Susan Broidy, Vicky Fanberg, Robert Millard-Mendez, Kurt Moore, and Martin Godfrey. A reception will follow Scafidi’s talk. The second talk is from 4:30-5:30 p.m. in the Whitewater Hall First Bank Richmond Community Room. Scafidi is the author of Sparks from a Nine-Pound Hammer (Louisiana State University Press, 2001), For Love of Common Words (LSU, 2006), The Cabinetmaker’s Window (LSU, 2014), To the Bramble and the Briar (University of Arkansas Press, 2014) and a chapbook Songs for the Carry-On (Q Avenue Press, 2013). He has won the Larry Levis Reading Prize, the James Boatwright Prize and the Miller Williams Prize. His poems have appeared in numerous journals and anthologies. He works as a cabinetmaker and lives with his family in Summit Point, West Virginia. The Regional Writers Series is funded by the School of Humanities and Social Sciences and Mindful Explorations.